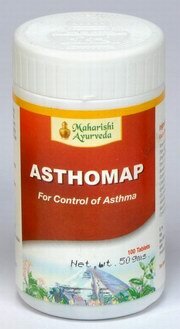 Asthomap is a judicious combination of herbs which counteracts respiratory allergies. Allays and arrests bronchospasms, exerts prompt mucolytic action, tones up the respiratory mucosal lining and ilates bronchioles. Asthomap contains natural immunomodulators which enhance the patients immunity to diseases. Asthomap corrects imbalance of vata and kapha and improves the quality of pitta to restore normal in respiration. Asthomap contains no steroids hence is safe for a long term use. Prolonged use of asthomap reduces hypersensitivity to allergens and reduces intensity and frequency of asthmatic attacks. Asthomap corrects digestion also. As an adjuvant in the treatment of chronic cough. Asthomap is not recommended in patients of congestive heart failure. Asthomap may be combined with salbutamol and other antisasthmatic drugs in the management of acute asthmatic conditions. After that acute phase is over. Asthomap should preferably be continued to minimize dependence on other drugs. 1 to 2 tablets thrice a day. A bottle of 100 Tablets.